The food and Environment Research Agency was an executive agency of DEFRA. Formed in 2009 it included the Central Science Laboratory shown above. The unhealthy commercial business involvement in this quango was revealed as part of another FOI request which stated that in 2011/12 they acquired £13.6 m from these activities. On 1 April 2015, continuing the unravelling of British quangos into Corporate takeover, DEFRA placed Fera into a joint venture called ” Fera Science Limited “, with Capita acquiring a 75% stake in the company for £20m. Although it was thought that this would be undertaken, when the bird was first sent to the laboratory following an inconclusive post mortem, there later followed an explanation that an “error in communication” had taken place between the VLA and The Food and Environment Research Agency (FERA). Total phosphorus had been tested for in both birds rather than the specific white phosphorus P4- the toxic poisonous material present in the sediment dumped there by the two companies, and also highly likely phosphorus based weapons on behalf of the British Government post World War Two. We wanted to forensically unpick who or what had led to this “error in communication”, and thus error in finding out the truth about dying birds on a pool contaminated with a banned rat poison. FERA responded in a covering letter which can be read HERE. Other documents were supplied. (i) Can you confirm that FERA’s laboratories do NOT have a test method validated by UKAS for white phosphorus and the reasons why this may be the case? 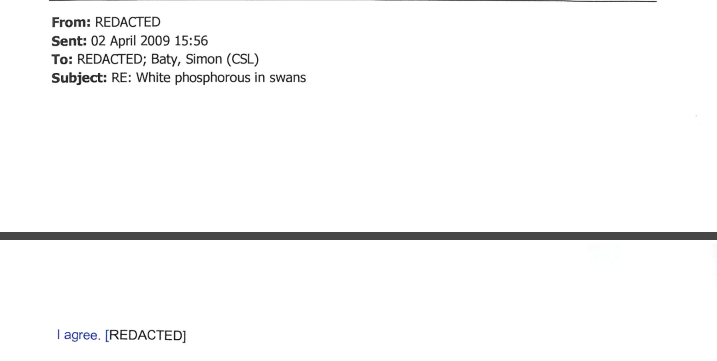 (ii) That you were approached with regard to testing samples of a mute swan and mallard by the veterinary laboratories agency in 2009 to undertake “a phosphorus test” regarding VLA reference number- 26-B0069-03-09, and what instruction you were given in this case and the results? “I can confirm that the Food and Environment Research Agency was approached by the Veterinary Laboratories Agency (VLA) in 2009 to undertake “a phosphorus test” regarding VLA reference number 26-B006903-09. The instructions we were given are contained within a letter from the Veterinary Laboratories Agency dated 16 March 2009 (annex 2). 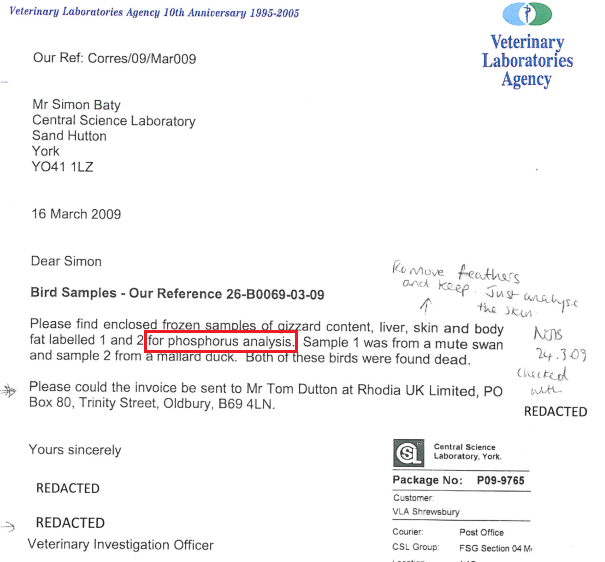 A LETTER REGARDING TISSUES OF THE DEAD SWAN AND MALLARD RETRIEVED FROM RATTLECHAIN TO A SIMON BATTY OF FERA FROM A REDACTED VLA OFFICER (Annex 2) CAN BE READ HERE. 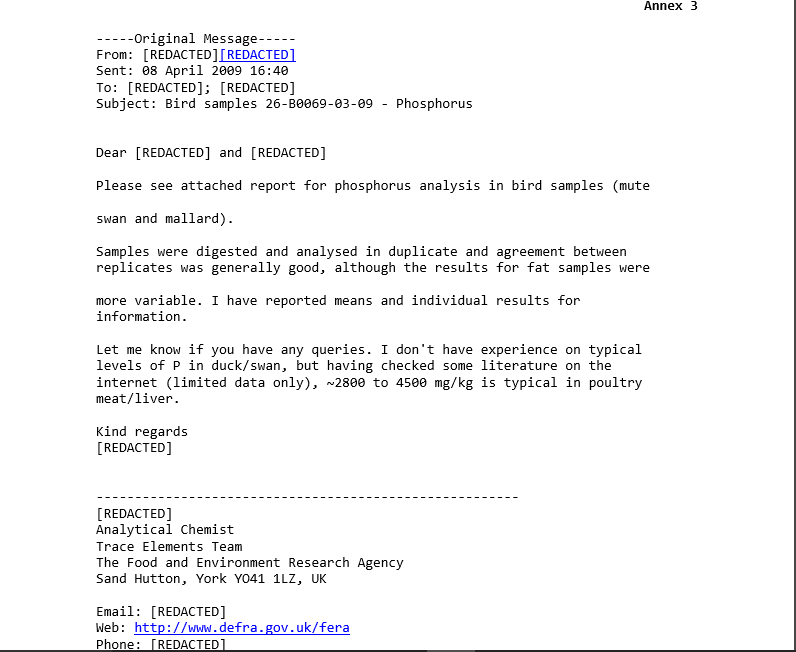 THE TOTAL PHOSPHORUS RESULTS TESTED IN THE FERA LAB IN TISSUES OF THE BIRDS (Annex 3) CAN BE READ HERE. (iii) Can you release all correspondence including emails between yourself and the VLA in regard to this issue? 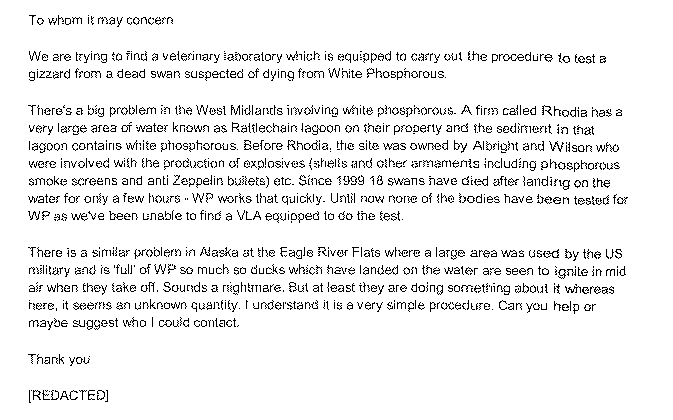 AN EMAIL STATING THAT THE OFFICER FROM FERA/CSL HAS NO EXPERIENCE OF TOTAL PHOSPHORUS IN WILDFOWL CAN BE READ HERE. A CHAIN OF EMAILS RELATING TO QUESTION 3 (Annex 4) CAN BE READ HERE. We have reordered the emails below in chronology and included where known the redacted names. 1. Email from the co-ordinator of the National Swan Convention to the VLA. An enquiry asking about testing for white phosphorus and a recap on the situation at Rattlechain and the Eagle River Flats study in Alaska. 2. This email was sent by Aiden Foster , veterinary pathology officer of the VLA in reply to the co-ordinator of the National Swan Convention. Note White phosphorus is mentioned as the subject reply. 3. Email reply to Aiden Foster by the co-ordinator of the National Swan Convention enquiring about what was happening with the white phosphorus test. 4. 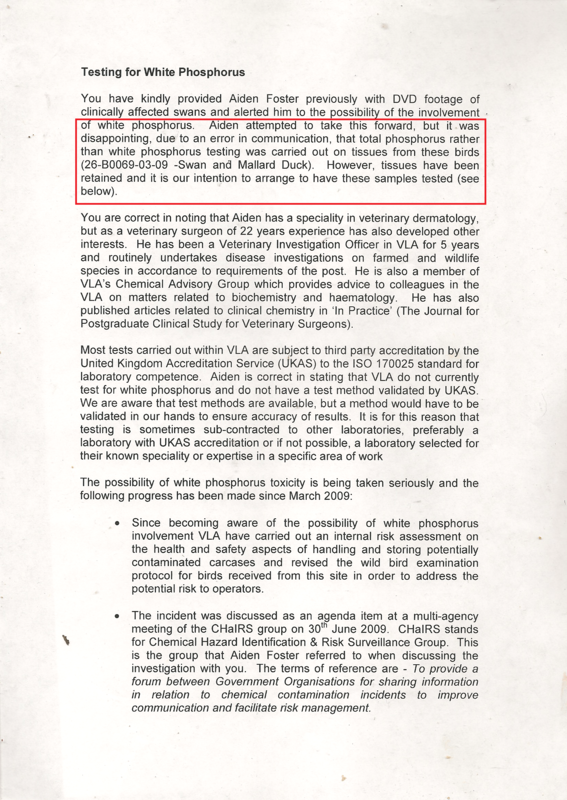 Email reply from Aiden Foster of VLA to the co-ordinator of the national swan convention stating that the report was not available to “Joe public” – thus revealing the closed link between a business customer 9Rhodia) with a vested financial interest in delivering a none poisoning link, and a publicly funded Quango. The Central Science Laboratory are just another link inbetween the two. NB white phosphorus is mentioned in the subject. 5. Email from someone at the VLA to Simon Batty “Business Development Manager” FERA and another unidentified. Given this is exactly the same script and colour of text used in the previous reply to the co-ordinator of the NSC, we believe this to be AIDEN FOSTER. He is “concerned” about the fact that a member of the public has an insight into the white phosphorus poisoning problem- having spoken to experts in the field in another country. Reading between the lines here it is quite apparent that he wants to censor the results and keep them between Rhodia and the VLA. I draw no other conclusion from this given his next statement that if I or the co-ordinator of the NSC were to enquire about the results then we should be given lies as to the current status of the tests. WHAT I WOULD SAY DIRECTLY HERE IS WHAT EXACTLY WAS AIDEN FOSTER’S PURPOSE IN TRYING TO NOT DISCLOSE THE RESULTS THAT WOULD HARM RHODIA’S CAUSE? 6.Email from Simon Batty of FERA presumably to others in FERA /CSL. Also copies in “trace elements team” at the CSL. Basically saying “do not give the public any results if they enquire.”- This could be bad for business, if the truth gets out. NB white phosphorus in swans is the subject matter. 7. 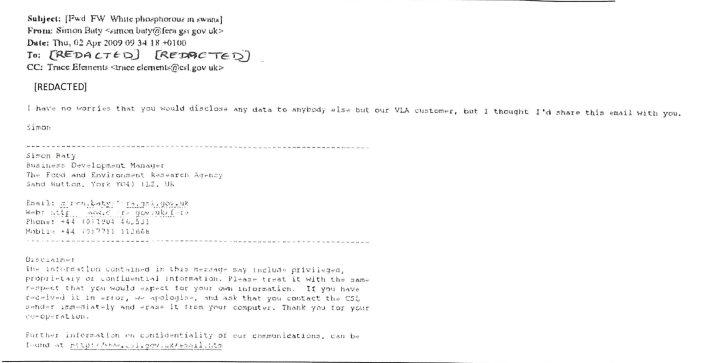 Email from Simon Batty in reply to Aiden Foster- stating that the VLA as “customer” would only be privy to the results. Confirmation that Aiden Foster would be the first to see the results, along with another unidentified. NB “white phosphorus in swans” is the subject title. 9. Another reply possibly from Aiden Foster to Simon Batty and someone else copied in. The confirmation that I am named once again in this email and given flannel about the results by the admin staff. With such contempt as this I will not hold back in the summing up of this email chain. NB “White phosphorus in swans” is the subject matter. 10.Email from Simon Batty to two other people at FERA (this can be seen @FERA in the redactions). This tells them to send the results to presumably Aiden Foster and someone else. “White phosphorus in swans” again noted. 11. 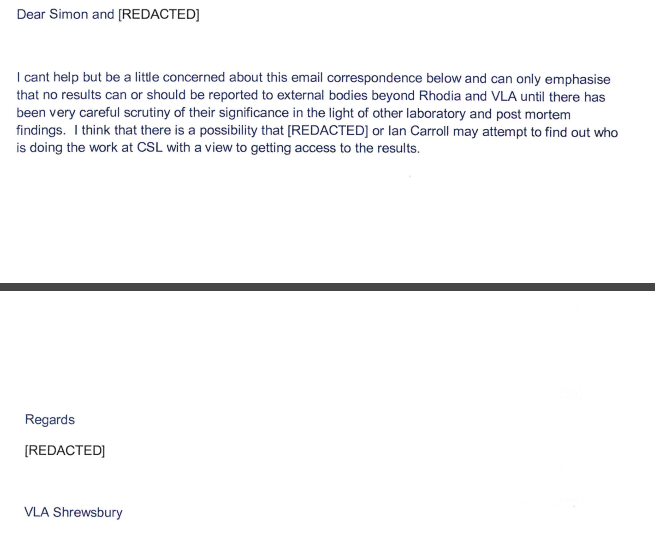 Email from CSL laboratory to Aiden Foster and another releasing the “phosphorus” report. This is supplied in Annex three in this FOI request. 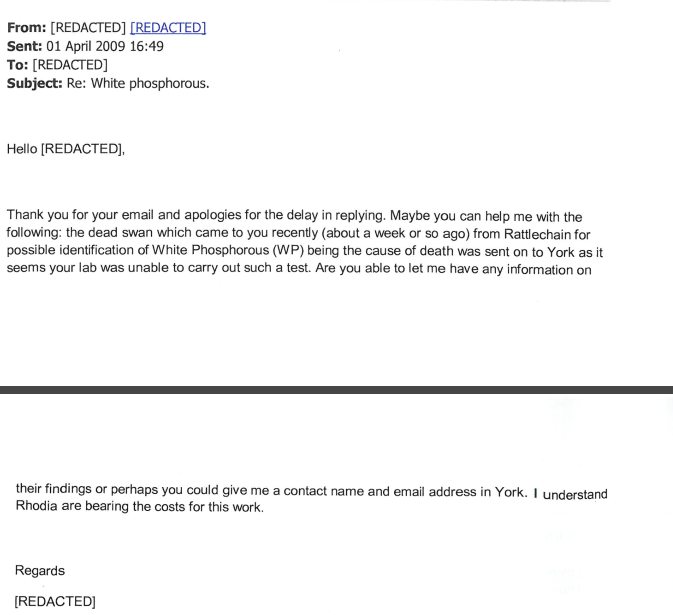 NB in ALL previous correspondence between the VLA and FERA “White phosphorus” was specifically asked for. As it is, the tester confirms that they have “no experience” in total phosphorus levels in swans and ducks- so what bloody hope white phosphorus when the fools cannot even appear to differentiate! 12. Email presumably from Aiden Foster to FERA/CSL confirming that he has received the report, but he is “struggling” to compare results for total phosphorus with the white phosphorus analysis in the Eagle River Flats study. Worth noting that the report was received within 20 days, as I was told. 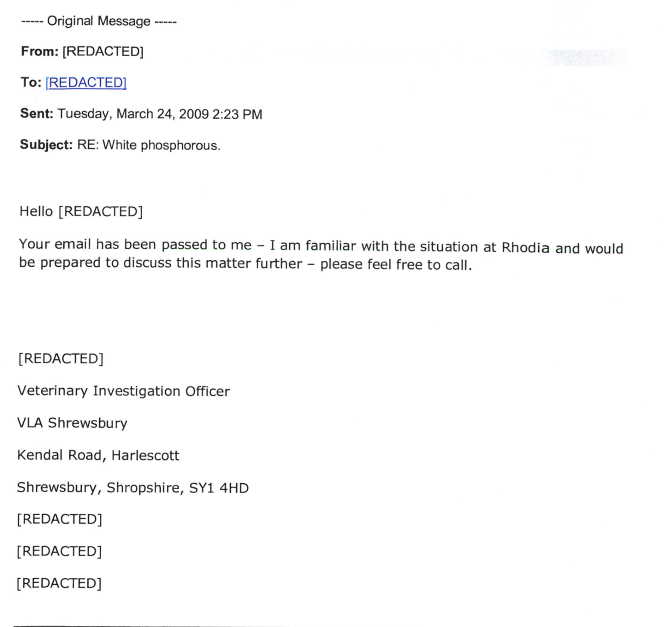 Note here- the email states “phosphorus” and not white phosphorus as has been stated in ALL previous correspondence between Aiden Foster and FERA. It is therefore impossible to see how he could have interpreted such results in a definitive diagnosis. Perhaps this is why he did not share the results, because he knew that we would ask the opinion of experts in the field in the US, and not vain amateurs within a UK quango setting. This instruction is clearly where this matter started to go wrong. 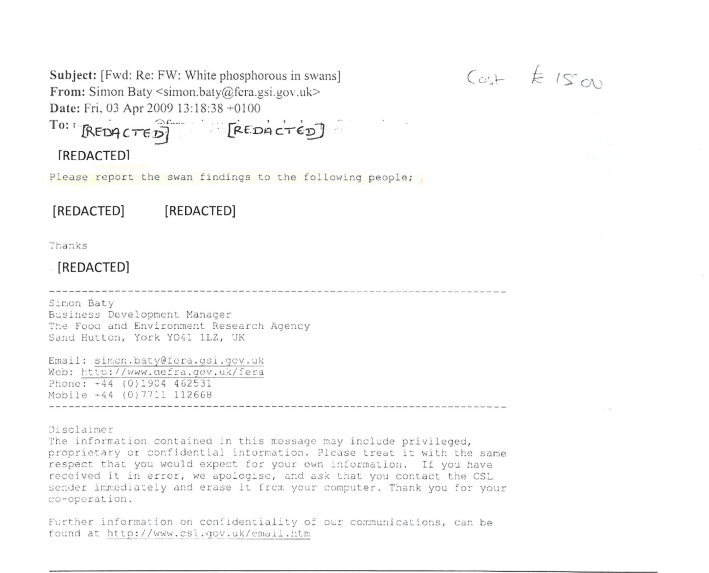 We believe the author of this letter to Simon Batty of FERA to be Aiden Foster as the redacted name. No mention here is made of white phosphorus and this is where the mistake was made and it is very , very poor. Despite this Simon Batty despite several emails with “white phosphorus” in the title of the emails appears oblivious to this. 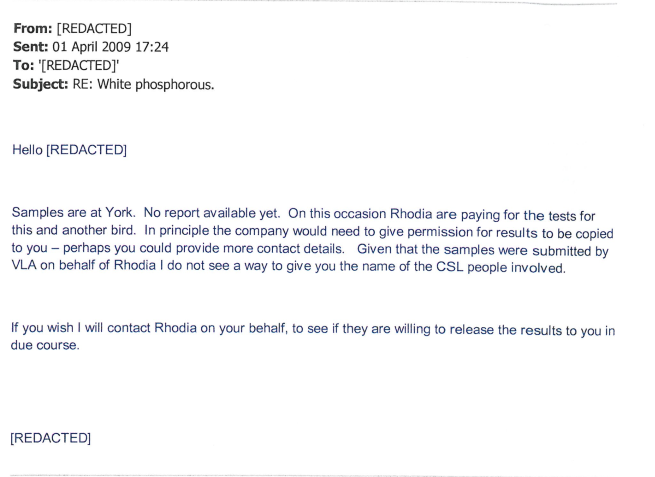 That the letter was also copied in to Tom Dutton of Rhodia and he makes no comment on the error only sums up what we already know about the deceitful company who had not even warned the VLA or myself about the risks associated with P4- the poisonous toxic banned rat poison that they knew to be responsible for the bird deaths all along. THEY COULD HAVE TESTED FOR THIS MATERIAL FROM DAY ONE EIGHT YEARS BEFORE IN 2001- AND PROBABLY DID SO. The fact that FERA claim to have experienced “insufficient demand” to test for P4 and were not even accredited as a laboratory is another appalling error on behalf of the VLA. We have looked at this “total phos up” elsewhere, and the opinion of a real expert in white phosphorus poisoning in wildfowl Marianne Walsh who was involved with the Eagle River Flats studies.